Wild rice is not a grain, but the seed of a native North American long-grain marsh grass. 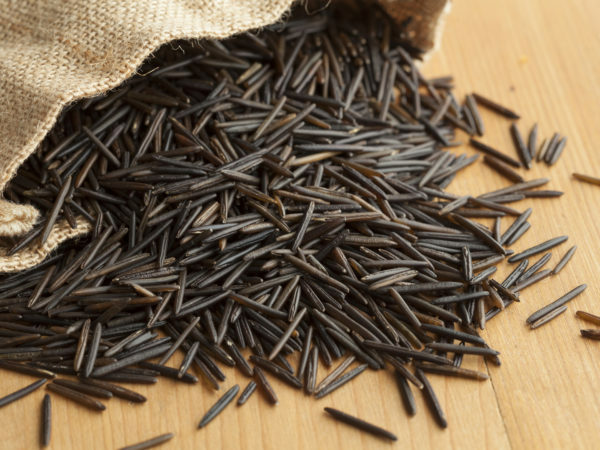 Hailing from the Great Lakes (though now mainly produced in California and Minnesota in flooded paddy fields), wild rice was once a staple of Native American cultures, such as the Algonquin, Ojibwa, Dakota, Winnebago, Sioux and Chippewa tribes, to whom this “good berry” was extremely valuable come long, harsh winters. 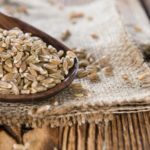 Its distinctive nutty flavor, chewy texture and purplish hue pair well with the earthy, autumnal flavors and colors of harvest-time foods. For a subtler flavor, some like to blend wild rice with brown rice in dishes such as stuffings and pilafs. Nutritionally, wild rice is as robust as the flavors it imparts; it contains almost twice the protein and fiber as brown rice, and is also high in B vitamins, manganese, zinc, potassium, phosphorous and magnesium, while being relatively low in calories. Wild rice is often scarified (meaning the surface of the outer bran is mechanically scratched), a process that lessens cooking time without lowering nutritional value, as polishing grain does (i.e. white rice). Wild rice is gluten-free. Avoid boxed wild rice mixes – in addition to being less fresh, the additives can contain traces of gluten. Wild rice keeps almost indefinitely if stored properly in a cool, dry, dark place.